It’s natural to want to give your parakeets treats, the same way you would a dog or cat. But, they are quite different animals, and there certainly aren’t as many treats on the market for a parakeet as there are for a more traditional pet. I frequently see people mention the Honey Bird Treat Sticks as a popular treat – with some folks even giving their parakeets a stick every week. There isn’t anything wrong with those treats, per se, but I don’t think they are the best treats for a parakeet. Parakeets can eat honey, but they shouldn’t have a lot. Even sugary fruits have to be limited, so a real sugar like honey should be a rare treat indeed. Also, if your parakeets get hooked on honey treats they may start rejecting normal seed and demand sugary treats all the time. 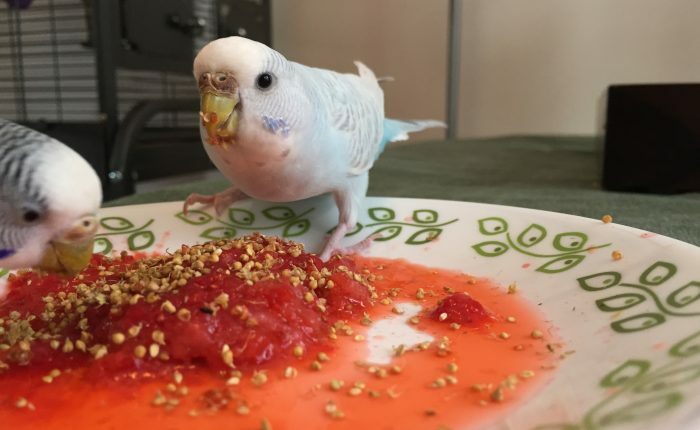 Maintaining a healthy budgie weight is critical to long-term good health, and trying to break a parakeet of a sugar habit would be a frustrating nightmare! Honey can be very useful to help perk up an ailing parakeet and get the some extra energy and calories to burn. I think that honey should be reserved for an emergency treat, you could even keep a Honey Straw or two in your parakeet’s first aid kit. If, like me, you don’t want to introduce honey as a regular menu item here are some other ideas for the times you want to spoil your parakeets a little bit. No treat list would be complete (or accurate!) if it didn’t include Millet . Spray millet is almost universally regarded by parakeets as the ultimate in pleasure food. If your new parakeet doesn’t realize yet this is his favorite food he probably will soon. I know there are a lot of Miller Spray Holders on the market so you can put a whole spray of millet in the cage with the parakeets, but I don’t recommend going that route. I think that if millet always comes from humans it’s a much more powerful bonding and training tool. Also millet readily available in the cage is the equivalent of me having a limitless bag of Doritos in my cube at work, no good would come of that for my health and I don’t think that unlimited millet will do your parakeets any health favors either. Vegetables and occasional fruits. I know, I know, you’re thinking I’m crazy because your parakeets currently won’t even look at a slice of cucumber without having a panic attack, or ignore it completely. And I’m telling you (virtually guaranteeing) that if you are persistent and keep offering the good stuff multiple times a week in a variety of different ways and/or mixed with seed and millet you will eventually wear them down and have a pack of veggie-lovers! The absolute key is persistence. You can’t say after a month of trying that they hate vegetables because that is not long enough. These little guys can be more stubborn and fearful than one could possibly imagine. New toys and perches. The great thing is that even though we might all joke around about “spoiling” our parakeets it really can’t be done! They need new toys and different perches regularly to keep their brains active and bodies exercised. So, if you were going to spend $4 on honey treats, why not spend it on the JW Pet Company Activitoy Lattice Chain Small Bird Toy instead? I’ve had that toy rotating in and out of cages for the past 2 years, which is comparably a great value! I’ll put links at the end of this post to a few inexpensive and awesome toys. Your time and attention. The best treat of all. Even if you’re still in the taming process and they can barely tolerate the sight of you, sit by their cage for 15 minutes and sing them a song. Every day when I get home from work my first instincts are to start tidying up the house, make the parakeets a snack and generally get on with the million and one things I have to do. But, I make it a point to make eye contact and greet them, let them out of their cages, and stay put. For as long as they are interested in jumping on my head, screaming in my ear, or chewing on the seams of my shirt, I chill out and just hang. Sometimes I talk to them about my day or theirs, and sometimes we are quiet together. Thinking about it now, even though it can feel painful to slow it down and stop being productive, it’s one of the best things I do both for the parakeets and for me. I’m sure there are a million other ways to treat your ‘keet, but that’s my shortlist of relatively healthy and inexpensive (or free!) best treats for a parakeet. thank you so much for making this it really helped me. i normally know a lot about parakeets, but i forgot about the treats they like except for millet. 😉 i tried putting apple slices and lettuce in the cage… they did not like it. my parakeets have never gone out of my cage because i dont think they’d ever get back in it. I feed them a mixture of seeds and when i first got them i got a spray of millet and held it up to them. they ate it and ate it and ate it until my arm got really tired and i just set it across the ladder in their cage. now they dont eat millet as much. they mostly just eat their food, play on the toys, screech, chirp, tweet, twitter, take afternoon naps, and cuddle together. i have been looking for some kind of special treat that will be at least a little healthy for my birds because i am training them and i want a treat that they will like to reward them if they do something good. ive been looking at oat sprays, but i dont know if they will like them. The birds cage is like your home, it will always want to revisit it for food and the safe feeling it provides to the bird. I personally only close my birds cage at night. Chloe is free to roam the house all day and has designated spots in the home she perches on. I combine a homemade treat of seed, millet, egg, oats, flour, water, and honey. This has been a success for my picky eater.